I'll let you in on a little secret. I don't know how to ski. Well actually, I've attempted to ski three times. In each attempt, it was a miracle I didn't break anything, or worse. So I now get my thrills watching Warren Miller DVDs, or the winter Olympics, from the comfort of my couch, and live vicariously through those with more athletic ability than I. 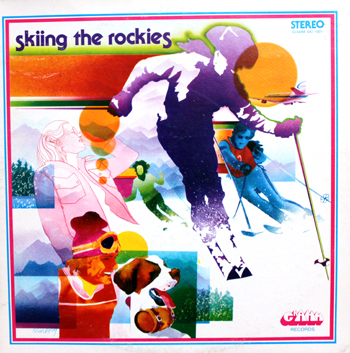 From the folks at the Great American Music Machine (GrAMM) out of Denver, Skiing The Rockies is a collection of songs about...skiing the Rockies. Recorded at Summit Studios in Denver the LP features the GrAMM duo of Ralph Harrison and Tim Schumacher (you'll see those names more than a few times in this blog, as they were pretty prolific). All of these songs are pretty mainstream, and sound like instant jingles for each resort. I guess in an attempt to appeal to a wide audience, they're all pretty generic. Not a whole heck of a lot of personality here. Lots of names credited on this album, including Margaret Andersen, Ralph Harrison, Rich Currans, Doug McKee, Craig Donaldson, Tim Schumacher, Connie Ellisor, and Dean Tellefson.